This post has been inspired by a mix of things, not the least of which is how I am feeling at the moment. With the recent passing of Robin Williams, my Facebook and Twitter feeds have been filled with tributes but also warnings about depression. One of the Unitarian Ministers on my Facebook feed (yes I have several Unitarian Minister friends) posted a challenge to share pictures for people who suffer (or have suffered) from depression, as it helps to show the faces of depression. So, I took this picture today while I was out on my bike ride. One of the reasons I ride is to fight depression, but the fight is becoming more difficult. I feel the need to write more about depression. The latest news regarding Robin William’s death just crossed my social media stream – that he had early onset Parkinson’s makes it seem that much closer to home. Yesterday represented a transition (last night really) – from control to loss of control. I took the above picture in the middle of my ride. I cried for most of the first 30km. It wasn’t until that point that I finally found myself back in control. I wasn’t sure the ride was going to work this time! Fortunately, when I felt the early signs, I began to reach out, and will have my first appointment with the oncology-psychiatrist tomorrow. It seems that at about the same time I reached out (about two weeks ago), Stanford opened a new oncology-psychiatry clinic. I will be one of the first patients! This is not my first bout with depression. I suffered from depression for about two years (2003-2005). Within the span of a year I (1) was laid off from my career at Nortel, (2) got married, (3) bought a house, (4) started a consulting career, (5) started grad school. By spring 2003 things were looking pretty good in my life, and yet I had difficulty getting out of bed in the morning. I was sleeping in excess of 10 hours a day, and I had no motivation. I wasn’t sad, I wasn’t anemic, I just wasn’t motivated to do anything. For me, depression appeared as a lack of motivation rather than sadness. 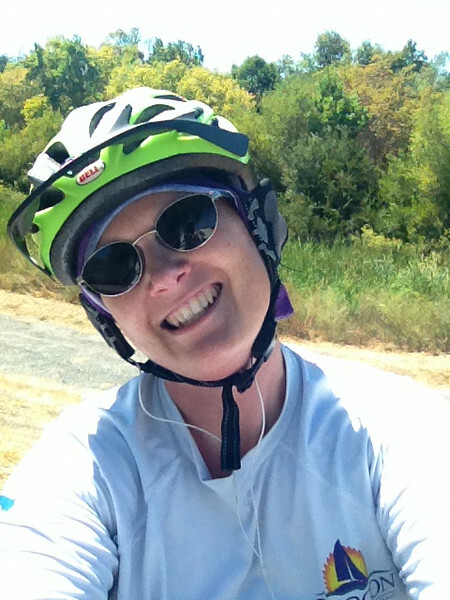 On my bike ride today, I reflected on what I had learned about my earlier depression. First of all, I know which drugs worked! But more, I know that what threw me off balance was uncertainty in my life. Losing my job was not a bad thing, but not knowing what I’d do next was a challenge. Relaunching a career wasn’t a bad thing either, but there was just too many of life’s big changes happening to me in too short a period of time. My brain couldn’t keep up. This time it is definitely about uncertainty, although my mom also pointed out the issue with ‘chemo-pause’ as a contributing factor. One of the side effects of the chemo drugs is a temporary an onset of menopause (young warriors call it ‘chemo-pause’). In addition to the whole uncertainty associated with having cancer, I’m also dealing with emotions that may be enhanced by ‘chemo-pause’. I’m thankful that there are now people at Stanford that understand the combination of factors involved. For those reading this who are also in treatment Stanford, if you are having any concerns (even mild concerns) with anxiety or depression, I urge you to ask for a referral to the new clinic. They have been fighting for three years to get it established. I’m grateful that it came to be just in time for me. Referrals do take time, and medications also take time to be effective, so don’t wait until it is really bad before asking for help. There is no certainty with cancer. Treatment is physically tough and the long road after treatment is emotionally and mentally tough. Be assured that I am well enough to know to ask for help when I need it. Thanks for this Rebecca. The control issue that comes with health problems can get pretty complex. On the one hand there a resistance to admit to need for help and we can’t hold it entirely together on our own. As an active person we may not even notice how we by-pass help and advice in our rush move ahead. Alternately, we a place of strength within ourselves and we can’t give up fighting even if the gracefulness of allowing others to help us seems the right thing. I’m starting to realize there are trade-offs and times when I need to back off and let things happen. I some ways it feels false or “weak” but it can be balanced by energy placed somewhere else where we can shine as we should. Don’t give into the damaged physical you as all you are. Blessings, Rebecca. I’m here if that is ever any help. I so can totally relate Becky. Sometimes things just get too overwhelming. I’m really glad to hear that there is a oncology-psych- I think it’s really important to understand the relationships between health and mental wellness. Coding notes: This is an important post – it represented a transition for me.